I think back nine years ago when President Barack Obama became the first African American President Of The United States and Michelle Obama became the first African American First Lady. As a African American I was so very very happy. I am not going to lie, I cried!! I never thought I would ever see a black man as the most powerful person in the world. But it happened. When President Obama became President millions and millions of citizens felt proud. Proud to be a American. I should say more proud to be a American. Truth be told, every time I saw President Obama or First Lady Michelle I was happy. When EVER I saw Prez Obama or Michelle on TV I stopped what I was doing to watch. Press conference after press conference. Speech after speech. Of course President Obama and First Lady Michelle became role models for millions and millions young African Americans and people of color and we felt it was great to have someone who looks like us in the White House. Of course the President could have done more as a African American in the White House. He could have spoken out more on all the killings in his home city of Chicago. He could have made more visits to Chicago. And he could done more on the unemployment situation going on in the African American community. We can also say of course all President’s could have done more….right? But again millions of us felt happy and proud to have a African American as President and felt proud Michelle Obama was our First Lady. Michelle Obama used her platform to speak to young African American girls. Asking them to take education serious and stay out of gangs and do not use drugs. She was a TREMENDOUS First Lady. Hell many say she was more popular than her husband. And she is popular as hell right now as is her husband. As we know, President Obama not only won the first time he ran he won a second term also! A African American man won two terms as President Of The United States. Unreal ladies and gentlemen. Readers I was lucky enough to cover President Obama aboard Air Force One when ever he visited my city of Seattle, Washington. In the eight years he was President I covered Air Force One at Seattle-Tacoma International airport five times and EVERY time it was a thrill to see the big 747 with the United States Of America land and then finally stop about a 100 feet from all the reporters. It was just great!! I can go on and on about my thoughts on the eight years of the first black President of the U.S. During the last few years in the White House, this businessman Donald J. Trump said over and over that President Obama was born in Kenya. Even with the President showing his birth certificate that let EVERYONE see Barack Obama was born in Hawaii. Last time I checked Hawaii is a state in the U.S.
Trump continued time and time again to say Barack Obama was born in Kenya. Today as the so called President, Trump STILL thinks President Obama was born in Kenya. It is a fact that Donald Trump (will NEVER call him President) has shown that he HATES President Obama!! Since he has been in office Trump has NEVER said ANYTHING positive about the eight years of President Obama. NEVER ladies and gentlemen has Trump said anything positive regarding President Obama. This is just flat out wrong!! Keep in mind readers, President Obama walked out the White House with a WHOPPING 60% APPROVAL RATING!! Currently Trump’s approval rating is at a VERY VERY LOW 36%!! President Obama is smooth! He knows how to handle Trump. Yes I wish Prez Obama would speak out more when Trump criticizes him over and over but this is the way he has decided to handle Trump right now. But Prez Obama is writing a book. Cannot wait until his book comes out. It should be VERY VERY interesting!! I just am thankful that I had a chance to witness eight years of President Obama and First Lady Michelle. A dynamic couple. Two very intelligent people. Two tremendous role models for younger African Americans and people of color. And oh yeah it has been great to see Malia and Sasha grow up to be beautiful young ladies. 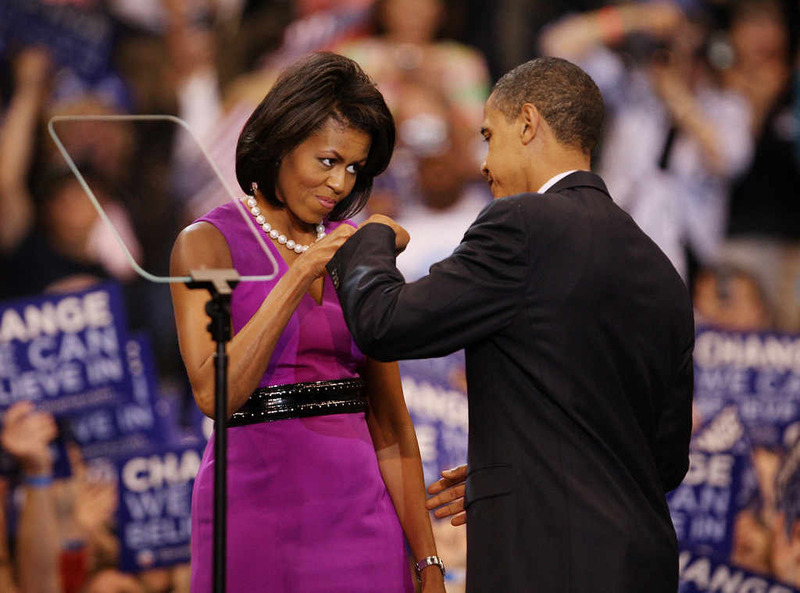 For sure from time to time I will be writing about President Obama and First Lady Michelle (will ALWAYS be First Lady to me) activities as private citizens. Slowly Prez Obama is doing more public speaking and Michelle also. Hopefully both of them will soon give their honest feelings on this fella who lost by a 3 MILLION votes and a man who is totally unfit to be President…Donald J. Trump. Next PostWhy Do African Americans March on MLK Day In Seattle? Involuntary Manslaughter For Murrey? This Is Wrong!